Most of the people were told that”Don’t put the magnet close with the electronic product. Because the electronic product will be damaged.” Is that true? And is there anyone know what the damage is? In this post, we’ll test what happens when we put a very powerful 6-inch neodymium magnet close to the electronic product, like a PDA, a calculator, different TVs and a computer. First up is the iPAQ. No, not iPad – the iPAQ. The PDA which is like a smartphone but just without the phone. When we put it on the magnet, the PDA decides to turn itself on. It never did before. Other times it completely reboots. However, it does seem to work even when directly on top of the magnet. The magnet did break the battery lid into pieces but there was no instant electrical death. The calculator worked flawlessly. It could do simple math, dividing by zero was still a major error. And even a sine-wave graph looked alright. It does help that the backplate and battery lid are held by screws. Very impractical when changing batteries but good for fighting a magnet. Next on the test bench is a 21 inch TV. Let’s first try our largest ferrite magnet on it. As you see that it is much smaller and ferrites are around 10 times weaker then neodymium magnets. So we should see a big difference in the effect on the TV. The four-inch ferrite magnet has an effect at around 30 centimeters from the TV. But the six-inch neodymium magnet at around 150 centimeters. And when there at zero distance the difference in strength is very noticeable and gives a quite beautiful show. That will be very cool, if you can watch it by video. But why does the image react on the magnet? Here’s the simplified explanation. The image is drawn using electrons that have an electric charge and therefore react in a magnetic field. A transformer delivers high voltage to a vacuum tube and this electron gun that emits electrons. The electrons coming out of the electron gun are focused to a beam using coils that are basically electromagnets. The coils can also guide the beam from side to side and up and down and in this way draw the image. But the electrons will also follow a strong external magnetic field. This almost looks like a screensaver – although it is doing anything but saving the screen. Flat screens don’t use electron beams so they are not affected in the same way. We did, however, manage to dim the background light on this LCD TV. Alright, this is the final fight. a computer but here we are at 1 meter. 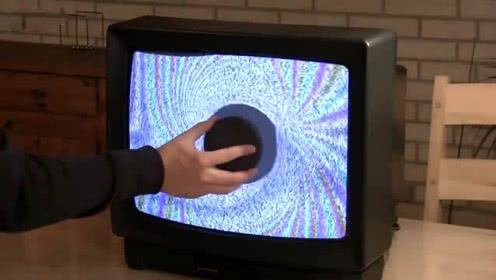 The monitor is reacting to the magnet but no instant death for the computer. Let’s go closer. At 60 centimeters the monitor has messed up but still no dead computer. It may have lost data but the picture We test with is still there. In order to avoid destroying ourselves, we wouldn’t go closer than four centimeters which is painful enough…After adjusting the screen we opened the picture again. But the picture folder seemed to be gone? And then, the result is it is dead. Later, the mouse pointer froze and we realized that the computer was dying. We killed it. We have officially killed a computer with our 6-inch neodymium magnet. And then something happens. Without any error message, the computer had restarted. After an error message about time and date not set we pressed F1 to boot and all we got were a blinking cursor and plinking hard drive. We hope maybe it would help if we removed the magnet. But the poor thing is the disk controller failure. That’s too bad. Later we tried to restart it again and received different errors. It never recovered. The conclusion of this post is that neodymium magnets must be kept away from things you don’t want to destroy. But you can have a large neodymium magnet in your home without blowing all the electronics into your backyard. At two meters distance from even the 6-inch magnet. The Earth’s magnetic field is the strongest so just keep a distance.